Remediation or Preparation: A Rose By Any Other Name? 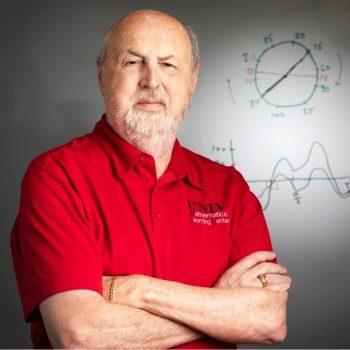 William Renwick Speer is currently the Director of the UNLV Mathematics Learning Center with mission-critical initiatives focused on successful transition to college, student retention, program progression and degree completion. Previously, he served as the Dean of the College of Education, as a Professor of Mathematics Education, and Director of the Center for Mathematics, Science and Engineering Education at the University of Nevada Las Vegas. He is also holds the title of Emeritus Professor of Mathematics and Computer Education from a twenty-year career at Bowling Green State University. His B.S. and M.S. Ed. degrees were achieved at Northern Illinois University in 1969 and 1971 while his Ph.D. was earned at Kent State University in 1976. Dr. Speer is a Past President of several professional organizations including the Research Council on Mathematics Learning, the School Science and Mathematics Association, the Ohio Council of Teachers of Mathematics, the Ohio Mathematics Education Leadership Council, the Nevada Mathematics Council, the Nevada Mathematics Education Leadership Council and the Nevada Association of Teacher Educators. He has served on the Mathematics and Statistics Advisory Committee for the College Board, served as a member of the Board of Directors for the Washington, D.C. based Triangle Coalition of Business, Government, and Education and, currently serves as a member of the Board of Directors of WestEd. He was a member of the NCTM Commission that released the landmark publication entitled Professional Standards for Teaching Mathematics. In 2018, Speer’s dedication to mathematics was recognized with the NCTM Lifetime Achievement Award. Dr. Speer was the primary author of the Wiley text, TODAY’S MATHEMATICS: Concepts, Classroom Methods and Instructional Activities, which culminated a publication run of 45 years with its twelfth edition, focusing on content/teaching methods for the elementary and middle grades. Dr. Speer was the General Editor for the NCTM annual yearbooks covering 2011-13, has been a contributing author on six major books, and has authored numerous articles in various professional journals. He is a Founding Member of the Research Council on Diagnostic and Prescriptive Mathematics, an organization that began at Kent State in 1973. He has also served on the Editorial Board for the research journal FOCUS on the Learning and Teaching of Mathematics (now renamed as Investigations in Mathematics Learning). In addition to receiving the NCTM Lifetime Achievement Award, Dr. Speer has been the recipient of major college and university-wide teaching, research, and service awards at both Bowling Green State University and the University of Nevada Las Vegas. He is the recipient of the Golden Anniversary Distinguished Alumni Award from the College of Liberal Arts and Sciences from Northern Illinois University as well as the 2014 Distinguished Alum at Kent State University and elected to the KSU College of Education and Human Services Hall of Fame. His service has also been recognized by three other major organizations through his selection for the Christofferson-Fawcett Award for Lifetime Achievement in Mathematics Education from the Ohio Council of Teachers of Mathematics, the George Mallinson Award for Distinguished Contributions to Mathematics and Science Education from School Science and Mathematics, and the James W. Heddens Distinguished Service Award from the Research Council on Mathematics Learning. Dr. Speer has lectured extensively throughout the United States, as well as lecturing and consulting in 37 countries on six continents. Perhaps most importantly, he has amassed classroom experience at each level and enjoys sharing and learning about how research informs teachers and how the classroom lends itself to generative studies of teaching and learning.